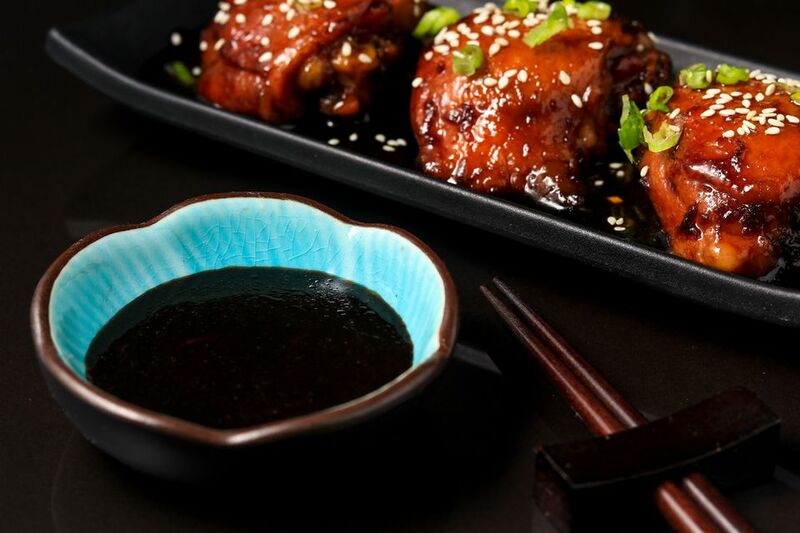 Teriyaki sauce is made using a combination of soy sauce, mirin (a sweet cooking sake), and sugar. While it can be made with just soy sauce and sugar, the addition of mirin adds a beautiful luster to the sauce. In a small saucepan, combine soy sauce, mirin, and sugar. Add more sugar, if desired, to suit your taste. If you are using the optional fresh ginger and/or garlic, slice or chop the ginger and garlic and add it to the other ingredients. Heat over a medium-high flame while stirring the mixture well. Lower the heat to medium and bring the sauce to a boil, then turn down the heat to low. Simmer the sauce for a few minutes until the sauce reduces slightly. Remove the pan from the heat and allow the teriyaki sauce to cool. If you added ginger or garlic to the sauce, strain the sauce to remove the ginger and garlic pieces using a strainer. Then use the sauce as desired. When making teriyaki sauce, the general rule for ingredients is a ratio of 1-to-1. For example, this recipe uses one part soy sauce (1/2 cup) to one part mirin (1/2 cup). Then, granulated white sugar is added to taste. Another simple teriyaki sauce recipe is a ratio of 1-to-1 with equal parts of soy sauce and granulated white sugar. This recipe works great if you do not have mirin in your pantry or if the ingredient is not easily accessible to you. Adding ginger and garlic is optional, but if you do choose to use them, if you want a mild flavor, slice them into big pieces. For a bolder flavor, chop them finely. You can vary the amount that you add to suit your taste as well. Traditional Japanese teriyaki sauce is thin in texture, in contrast to the typical bottled teriyaki sauce which tends to be very thick and sticky. Westernized recipes for teriyaki sauce may include the addition of a slurry of cornstarch and water (1-to-1 ratio) to thicken the sauce, but the addition of a cornstarch slurry is entirely up to you. What Are Some Japanese Staple Foods? What in the World Is Japanese Onigirazu? Find Out Here!